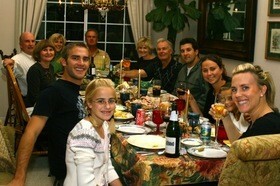 Are you hosting the family Thanksgiving dinner this year? The following tips will help you get through the day and still give you plenty of time to entertain and enoy your guests’ company. The trick is to plan early and do things in stages… As soon as Halloween is over, you should start thinking about your Thanksgiving dinner plans. Send out Thanksgiving dinner invitations. Include your phone number and ask guests to respond by a specific date. This way you’ll know how many guests you will be serving and you can begin to plan your Thanksgiving budget. When your guests respond to your invitation, check with them to find out if they have any food allergies or special dietary needs. Some of your guests may be vegetarian and you will certainly want to accommodate them. Talk to family and friends to see if you can borrow tables and chairs, if necessary. Check to see if you have all the Thanksgiving spices and staples on hand that you will need for the big day. If not, stock the spice rack and load up on flour, salt, sugar and all other staple items. If you will be entertaining a large number of Thanksgiving dinner guests, ask each guest to bring a side dish. If you are preparing all of the food yourself, be certain to choose some dishes that can be frozen. This will eliminate having to cook all the food on Thanksgiving Day. Purchase a frozen turkey and store it in the freezer. If you prefer fresh turkey, order it now. Determine the size of turkey you will need. If you want turkey leftovers, use the ration of one pound for each child attending and 1-1/2 pounds for each adult. There are dozens of ways to cook turkey leftovers for you and your family to enjoy in the days following Thanksgiving. Check outdoor equipment if you are planning to make barbecue turkey or smoked turkey. Clean your refrigerator from top to bottom before going to the grocery store. This will ensure that you have enough room for your Thanksgiving foods. If food utensils and your turkey platter have been packed away, clean them thoroughly. Determine which pots and pans you will use to cook specific foods. Clean the house thoroughly and don’t forget to include floors and windows. You want your house sparkling when your guests arrive. If a deep-cleaning is in order, you’ll want to do a couple weeks in advance of the big day, so you’re not rushing.